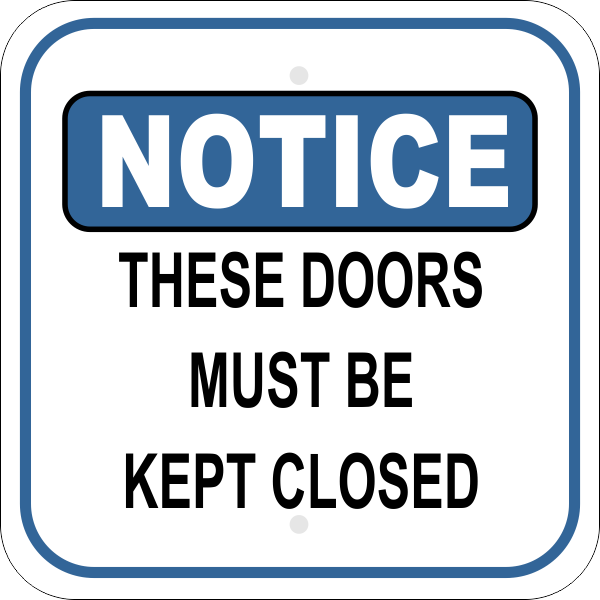 Provide ample notice about doors that must stay shut with this heavy-duty notice sign. ADA Sign Horizontal 3" x 16"
Color Sign Horizontal 1" x 14"
Executive Wall Name Plate Holder with Full Color Insert (Square Corners) 2" x 8"
This 12 inch square notice sign reads "THESE DOORS MUST BE KEPT CLOSED." Make sure your building is secured by posting appropriate signs such as this "these doors must be kept closed" sign that measures 12" x 12" and has a full-color design, rounded corners and pre drilled holes.